Homer tries to explain the medical procedure he needs to the kids using Akbar and Jeff puppets, characters from Matt Groening's Life in Hell comic strip. Burns: Look at that pig. Stuffing his face with donuts on my time! That's right, keep eating...Little do you know you're drawing ever closer to the poison donut! There is a poison one, isn't there Smithers? Smithers: Err...no, sir. I discussed this with our lawyers and they consider it murder. Burns: Damn their oily hides! Marge: Can't you do something for him? 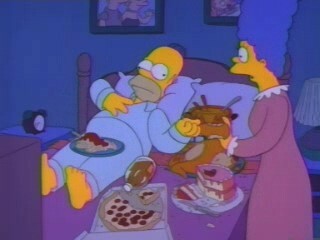 Homer: Don't worry, Marge. America's health care system is second only to Japan, Canada, Sweden, Great Britain, well, all of Europe, but you can thank your lucky stars we don't live in Paraguay! Bart: Nothing you say can upset us. We're the MTV generation. Lisa: We feel neither highs or lows. Homer: Really? What's it like? Apu: Poor Mister Homer. Could it be that my snack treats are responsible for his wretched health? Customer: I need some jerky. Apu: Would you like some vodka with that? Customer: Oh, what the hell, sure. Another righteously funny classic, and one of the last times that Homer's health is taken seriously (along with the family's financial woes). Despite the serious subject matter, the script for this episode does a lot to lighten the mood, and it's packed with tons of great lines (I could have easily doubled the "Favorite Quotes" for this episode), a strong turn by Dr. Nick Rivieria, and some humorous commentary on the state of healthcare that's sadly as relevant today as it was in 1992. There are also some genuinely sweet moments, as Homer and the family grapple with his mortality. Despite the implied invincibility of the lead character in an animated sitcom, those moments do a fantastic job of making us worry about Homer even while we're laughing; after all, we know he'll pull through, but his family doesn't. A relatively realistic take on Homer's health that also manages to be incredibly funny, featuring tons of classic lines. When i got to the line about the healthcare i was just thinking about how it's still relevant. Probably even More relevant. That's both terribly depressing, but also really really cool, that they wrote a joke that lasted for 20 years and became more relevant. @Sarah:That's both terribly depressing, but also really really cool, that they wrote a joke that lasted for 20 years and became more relevant. That is indeed some mighty fine unintentional prescience. They ain't the MTV generation any more. Or if they are they're a different kind of MTV generation — both in terms of actual years and in what MTV "means" anymore. But oh, yeah, is that commentary on health care still too too true. Unintentional Prescience is my new band name. @Blam: Or if they are they're a different kind of MTV generation — both in terms of actual years and in what MTV "means" anymore. Yeah, "MTV Generation" definitely doesn't mean quite the same thing now that it did in 1992. Are you saying that when Homer's stomach is going to explode due to too many cannon balls fired into his stomach was NOT a serious take on Homer's health? 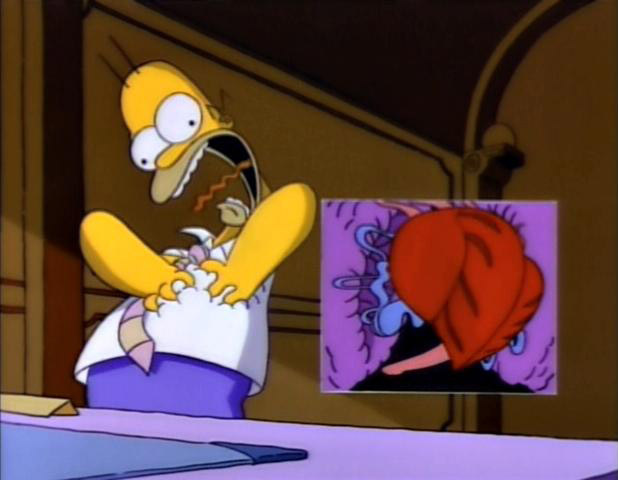 @Dr. Bitz: Are you saying that when Homer's stomach is going to explode due to too many cannon balls fired into his stomach was NOT a serious take on Homer's health? Yes. That is exactly what I'm saying. (Interestingly enough, that episode comes at the very end of the 7th season, which is the point many fans use to mark the end of the Golden Age, though I personally tend to extend that to season 8, if not all the way out to season 10, though there are a lot of episodes in seasons 9 and 10 that presage the zaniness that will dominate in season 11). The Homer gets fat and works from home episode was kind of serious regarding his weight. Or did that episode already happen? @Dr. Bitz: Nah, that was season 7 as well, so it hasn't happened yet. "King-Size Homer" was the one episode I thought of that might deflate my "this is the last episode to treat his health seriously" claim, but I'd argue that while the ramifications of his weight gain in that episode are handled fairly seriously, the whole thing is waved away at the end by a promise of liposuction and the ever-present Simpsons reset switch, which is a little less serious than the family dealing with Homer's mortality leading up to open heart surgery. 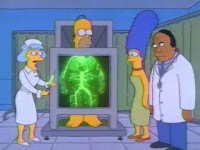 But you could certainly make a case for "King-Size Homer" being the real "last episode to take his health seriously". 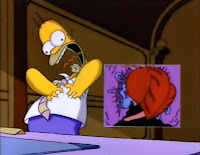 You know, we can chastise the Simpsons reset switch all we want, but it beats later seasons when things revert back to normal after every episode without any explanation. Like when Marge became an fitness center mogul and then it was never spoken of again. 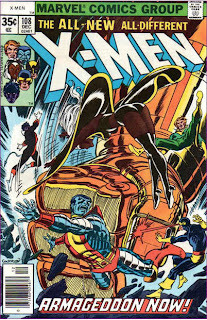 ...but it beats later seasons when things revert back to normal after every episode without any explanation. True. At least "King-Size Homer" gave us the liposuction explanation for the following episode's reset.